featuring guest authors; crafting tips and projects; recipes from food editor and sleuthing sidekick Cloris McWerther; and decorating, travel, fashion, health, beauty, and finance tips from the rest of the American Woman editors. Pat (Patricia) Stoltey is the author of four novels. She lives in Northern Colorado with her husband Bill, Sassy Dog, and Katie Cat. Learn more about Pat at her website/blog. The characters in my new novel are about as un-cozy a bunch as you’d ever want to meet. Or not want to meet, to be more precise. I created a little fictitious village called Sangamon that sits on a river in east central Illinois in 1833-1834. Young Jo Mae Proud lives there in a run-down log cabin with a down-on-her-luck mother and much-older half-brother Caswell. I gave Jo Mae a monumental challenge, then surrounded her with flawed, not-so-nice adults. Bad things happen to Jo Mae along the way. The worst character in the book, Caswell, is murdered. But we know there’s always good to be found, even when evil seems to rule the times. Jo Mae finds the good in the old Kickapoo Indian named Fish and escapes Sangamon in search of a better life. Bringing a story like this to Killer Crafts & Crafty Killers might seem odd, but during my research, I found mention of so many early American crafts. The big loom that appears in one home in the story is something I saw in a museum. Jo Mae’s home had not so much as a needle or even a bar of soap, and her best dress was fashioned from a printed feed sack. How many of you are even old enough to remember what those old feed sacks printed with tiny flowers looked like? No fancy cooking went on in the Proud household. Boiling a small piece of meat or fish with vegetables was the best Jo Mae’s mother could do. When Jo Mae goes to live with the old Kickapoo Indian in his camp by the river, she learns a little more about eating good food. She also learns not to throw a handful of dried apples into the stew. The apples were windfalls…and they were wormy. Once tossed into the cookpot, the worms floated to the top, a very unappetizing sight. Drying foods is a good way to preserve an overabundance of fruits or vegetables in today’s world, too. I’d recommend not using wormy apples. Slice them very thin (as with a mandolin, if you dare), and dry them in your oven. There are directions online for the process as well as recipes for using the dried fruits. When researching this type of information for Wishing Caswell Dead, I visited the Museum of the Grand Prairie in Mahomet, Illinois. There was a wealth of information, including hand-quilted goods and needlework, tools, machines, and items used in homes and for cooking. I was most interested in quilting, something I’d like to try for myself one of these days. I have an antique quilt that I’m afraid to display for fear it will be damaged in some way, especially as I have a cat with claws and a dog who loves to cuddle into cozy blankets. At present, I take the quilt out from time to time and refold or roll it to avoid permanent creases. The quilt came from Illinois originally and its age was authenticated by the Illinois State Museum. 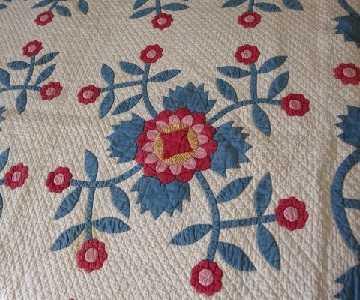 It’s not quite as old as the quilts that characters in the Village of Sangamon would use, but it’s certainly representative of the style and design of those times. I’d love to know if any of you are expert quilters, and if you quilt by hand or by sewing machine. Any weavers with a loom at home? What about cooks who dry fruits and veggies for use later? I won’t pretend Wishing Caswell Dead is full of killer crafts, but that historical period offers excellent ideas for today’s crafty reader looking for new projects…or for the crafty cozy writer looking for new plots and characters. In the early 1800s in a village on the Illinois frontier, young Jo Mae Proud wishes her cruel brother dead. Forced into prostitution by Caswell, Jo Mae discovers she is pregnant and vows to escape. When Caswell is injured by a near lightning hit, he becomes more dangerous, and more hated. The flawed residents of the Village of Sangamon harbor many secrets. Caswell knows them all. Will he tell? Jo Mae runs away and eventually finds shelter with Fish, the old Kickapoo Indian who camps by the river. 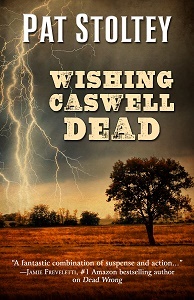 Wishing Caswell Dead is an historical mystery about the evil that hides within a village, one girl who is determined to save herself and her child, and a violent murder no one wants to solve. Since I don't have a talent for quilting or needlepoint, I have a great admiration for those who do! Happy Holidays, Pat, and best wishes for the new year! Thanks for stopping by, Angela! Happy Holidays to you as well, and may your 2018 be filled with joy and great books. Lois, I appreciate the chance to appear here at Killer Crafts so much. Thank you! I'm not a quilter but I know that quilting bees were one way early American women got together for a practical social event. I read about it with interest. Also, your novel sounds like a great read! Congrats on the new publication. Fortunately, Pat, I like gritty mysteries better than cozies! The quilt is beautiful. Maybe you could hang it on a wall? Somewhere there isn't too much sunlight? It seems a shame not to display it. Somewhat unrelated, but I have a 45-year-old Jim Morrison t-shirt that I finally decided to display. I'm sure the light will deteriorate it even further, but hey, it's nice to enjoy something from my past. I'm sure the library has received your book by now, but it's bogged down in processing. But on my list! I had a quilt my grandmother made. It has a bit of a story since it was given to my mother on her wedding day. My mother then passed it to me on my wedding day. I came up with an idea of how to pass it to my granddaughters. Granted I hated to divide the quilt but did it anyway. I cut squares, hemmed the edges and placed each in a frame. Then I wrote the story of the quilt for each child. They have all treasured the framed pieces and kept the story. I used the scraps to make angels for each girl. I tried to add a picture but it wouldn't paste. Hi Jacquie, thanks for stopping by. A quilting bee did sound like fun -- no television, no computer with social media, just good women making good conversation (and maybe a bit of gossip). Mary, this is indeed a gritty story so hopefully you'll enjoy it. I know the ebook is available now and the hardcover should be on its way soon if not already. I received my first copies yesterday. Linda, I think dividing the quilt for framing is a wonderful idea. This one I have was inherited by my mom from a family friend, so I don't know anything about its history. It's a shame. I'm sure there's a story that got lost along the way. Lovely quilt, Pat. I don't quilt but I've tried everything from basket weaving, fine needle work, and many other crafts in between, but my favorite of all is stained glass. Some are shown on Pintrest. Your book sounds great. Thanks for stopping by, Carole. I guess there aren't enough days in our lifetime to try every art and craft we'd like to experiment with, but I've made clothing, crocheted a lot, painted in watercolors and acrylics, tried a little cross stitch embroidery, hooked a couple of small rugs, etc. It's all fun and feels good to get lost in a creative mode that feels like meditation. I don't think I'd call myself an expert, because I cut too many corners for that, but I've made an awful lot of quilts, all by machine. One of these days I'll hand quilting a try, but there are only so many hours in the day and there are sooooo many things I want to try. As a teen, I slept under quilts my great grandmother and maybe her mother had made. It didn't do them any good as far as preservation goes, but it sure built a lot of lasting memories. Somehow I think that's better than pristine quilts stored away from dust and sunlight and human eyes. Michelle, I've kept that quilt pristine and stored away long enough. I'm going to make up my mind to either use it, or let a museum have it. You're right. I would imagine the person or group who made the quilt would be horrified to think of it wrapped up and stored away in plastic box. Keep up with Lois and Anastasia by subscribing to author Lois Winston's newsletter where you'll find special features, contests, and giveaways available only to subscribers. Read about Anastasia in the Anastasia Pollack Crafting Mystery series by Lois Winston. Assault With a Deadly Glue Gun, the first book in the series, received starred reviews from Publishers Weekly and Booklist. Kirkus Reviews called it "North Jersey's more mature answer to Stephanie Plum." Assault With a Deadly Glue Gun was also a Book of the Year Award nominee from ForeWord Reviews, a Daphne du Maurier Award finalist, and a Readers Choice Award nominee from the Salt Lake City Library System. Other books in the series include Death by Killer Mop Doll, Revenge of the Crafty Corpse, Decoupage Can Be Deadly, A Stitch to Die For, Scrapbook of Murder, and Drop Dead Ornaments, plus three mini-mysteries: Crewel Intentions, Mosaic Mayhem, and Patchwork Peril. Look for more of Anastasia's adventures coming in the future. I'm the crafts editor at American Woman magazine; the single parent of two teenage boys and a Shakespeare quoting parrot; caretaker to a semi-invalid, communist mother-in-law from Hell and her demon dog; daughter to a multi-married descendant of the Czars (supposedly); reluctant cat-sitter to Mama's extremely corpulent white Persian cat; a born Jersey girl; and star of my own amateur sleuth mystery series. copyright 2010 Lois Winston. All rights reserved.